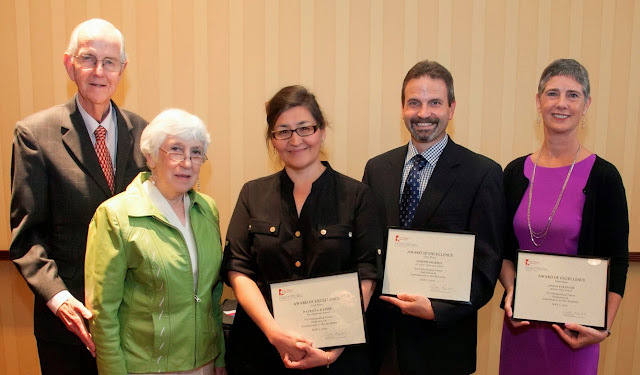 The Texas Medical Association (TMA) named six Texas science teachers winners of the 2015 TMA Ernest and Sarah Butler Awards for Excellence in Science Teaching. These educators help create tomorrow’s physicians by inspiring students in the field of science. Pictured left to right: Ernest Butler, MD; Sarah Butler; Patricia Kassir of The Bendwood School in Houston; Joseph Morris of All Saints' Episcopal School in Fort Worth; Anna Loonam of Bellaire High School in Bellaire. TMA believes awards like this that encourage excellent science teaching are important, as only 32 percent of Texas eighth-graders have achieved proficiency in science, according to the National Science Foundation’s Science and Engineering Indicators 2014 report. Through this award, TMA hopes to help improve these numbers by recognizing innovative teachers and providing them resources to continue motivating and engaging students. Eventually, TMA believes, some of these inspired students will choose medicine as a career. Some already have: Several TMA physician leaders were once taught by teachers who later won this award. Mrs. Kassir teaches the gifted and talented program for medical science to grades 3-5 at The Bendwood School in Houston. She teaches because she wants to “improve the lives of others and foster understanding.” Mrs. Kassir’s career spans decades, disciplines, languages, and countries, including two years teaching English at an Islamic school in Lebanon. An immigrant to America at the age of 7, Mrs. Kassir speaks English, Spanish, French, and some Arabic, and is an expert at reaching out and connecting to students regardless of their background or socioeconomic status. Classes with Mrs. Kassir are filled with debates and interactive labs, from “CSI”-style frog “autopsies” to a mock medical school. “A teacher like Mrs. Kassir is a rarity,” says Jana Bassett, principal at The Bendwood School. “We often joke that as we all age, her students will be addressing our medical needs.” In no place is this more evident than Mrs. Kassir’s own children, who are pursuing their own paths in science, the oldest of whom is a first-year medical student at Baylor College of Medicine. Mrs. Loonam teaches advanced placement biology at Bellaire Senior High School in Bellaire. She is described as a “legend” within the Bellaire community. Mrs. Loonam encourages students to design their own science experiments, cultivate plants on the school’s “green roof,” and create mini-movies explaining difficult science concepts. “I firmly believe in providing students with opportunities to ‘do science,’ ” she says. Each year, she introduces students to the scientific community by taking them to the Sam Rhine Genetics Update Conference, and hosting Genetics Night, where students explain their research of a genetic disorder to peers, parents, teachers, doctors, medical students, and administrators from Baylor College of Medicine. “As a medical school teacher of a number of Mrs. Loonam’s former students, I have seen first-hand that she is a transformative and innovative teacher who created an intellectual legacy,” says Joseph Kass, MD, JD, a neurology professor at Baylor College of Medicine and father to a student in Mrs. Loonam’s class. TMA awards each top recipient a $5,000 cash prize, and each winner’s school receives a $2,000 resource grant toward its science programs. Second-place winners are Laura Wilbanks of Whiteface Elementary School in Whiteface, Carol Raymond of E.A. Young Academy in North Richland Hills, and Theresa Lawrence of Friendswood High School in Friendswood. Second-place winners’ schools each receive a $1,000 resource grant to enhance science classroom learning. The TMA Ernest and Sarah Butler Awards for Excellence in Science Teaching are supported by the TMA Foundation, the philanthropic arm of TMA, thanks to an endowment established by Dr. and Mrs. Ernest C. Butler of Austin and additional gifts from physicians and their families.